Merrillville-based White Lodging has completed its year-long renovation to the Indianapolis Marriot Downtown. 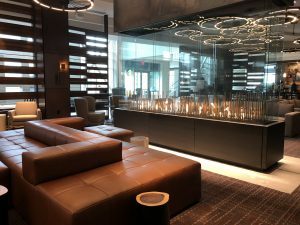 Merrillville-based White Lodging has completed its year-long renovation to the Indianapolis Marriott Downtown, 350 W. Maryland St. The project included redesigning the lobby and meeting spaces, along with new dining options and a grab-n-go market. Accommodations increased from 622 to 650 and each room was updated to include modern furnishings and décor. The hotel’s meeting and event spaces increased to 45,000 square feet and now features 37 meeting rooms, 15 breakout rooms, two ballrooms as well as four new meeting rooms. White Lodging, established in 1985, is a hotel ownership, development, and management company with more than $1 billion in annual revenues. The company operates 90 hotels, 30 restaurants/bars and 26 brands — including Marriott International, Hilton Worldwide, Hyatt Global, and InterContinental Hotel Group.